A paper to appear in the January 18, 2005 edition of the journal PLoS Biology has its roots in a collaborative effort among UCSC researchers with different specializations. The paper outlines an unusual RNA structure in the SARS virus that offers a promising antiviral drug target. When the SARS epidemic first struck and its genome sequence became available in April 2003, a vacationing member of the UCSC Genome Bioinformatics Group, Angie Hinrichs, prepared a genome browser for it from an Internet café in New Zealand. The team in Santa Cruz chimed in, and the browser was online with alignments to other viral genomes within three weeks. One researcher who took advantage of the browser was Robert Baertsch, a graduate student in David Haussler's bioinformatics lab. 'I aligned every known RNA virus to it, so that I could see what segments were conserved across species.' Since RNA viruses normally mutate quickly, any segment that stays the same in distantly related viruses might be critical for the virus to replicate efficiently in the host. Such a region could be the target for a drug designed to interfere with its function and thereby block infection. One segment popped out, Baertsch said, 'a section at the 3' end of the genome known as s2m RNA, which is not associated with any gene, showed remarkable conservation across species.' Sequence analysis by Haussler and Baertsch found that viruses in two families, coronaviruses (which include the SARS virus and the common cold) and astroviruses, share the element. Curious about the conserved segment's biological role in the virus, Baertsch showed it to molecular biologist Manny Ares. With his research assistant, Haller Igel, Ares cloned the RNA and chemically characterized it, finding that it adopts a uniform structure in solution. This makes it a good candidate for crystallization. Ares enlisted Bill Scott, a structural biologist with experience in x-ray crystallography of RNA. Scott and his postdoc Michael Robertson (the first author on the PLoS Biology paper) solved the 3-dimensional structure of the segment in question. It took almost 9 months for Scott and Robertson to produce large amounts of the RNA, identify conditions where it formed crystals, and solve the structure. 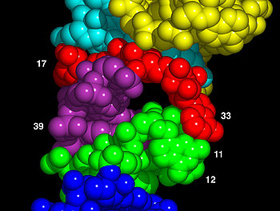 The results showed several unique and interesting features of the s2m RNA, including a distinctive fold that appears to be capable of binding to certain proteins involved in regulating protein synthesis in cells. "The structure gives us strong hints about the function, because it forms a fold that has been implicated in binding a certain class of proteins," Scott said. "The structure itself also provides a starting point for designing antiviral drugs that might bind to this RNA and prevent it from doing whatever it is that is vital to the life cycle of the virus." Now that the structure is known, the Scott and Ares labs are working together to determine its function.